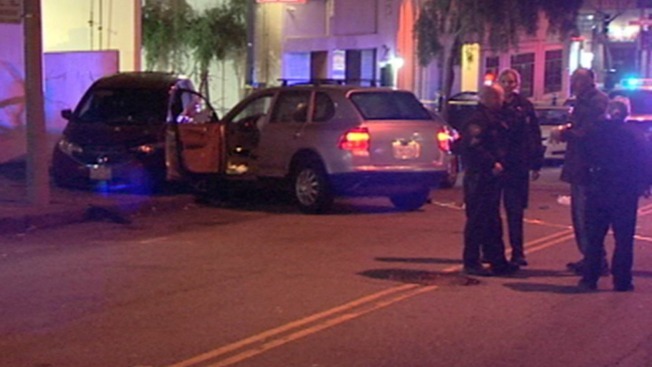 An adult male in San Francisco was fould shot and killed early Wednesday following a car crash, according to police. The fatal shooting occurred around 2:15 a.m. near Eddy Street and Van Ness Avenue, police said. Arriving officers found the man suffering from head trauma consistent with a gunshot wound, according to police. He was later pronounced dead at the scene. The shooting is being investigated as a homicide, but no suspect information has been released. The victim's identity has also not been released. Anyone with information is asked to contact the San Francisco Police Department at 415-575-444 or text a tip to TIP411 and begin the message with SFPD.